I am always on the hunt for new chicken dishes. 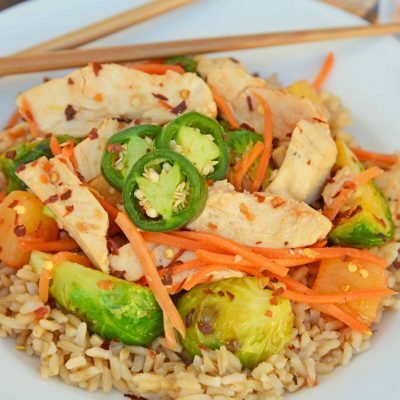 Non-boring chicken dishes. 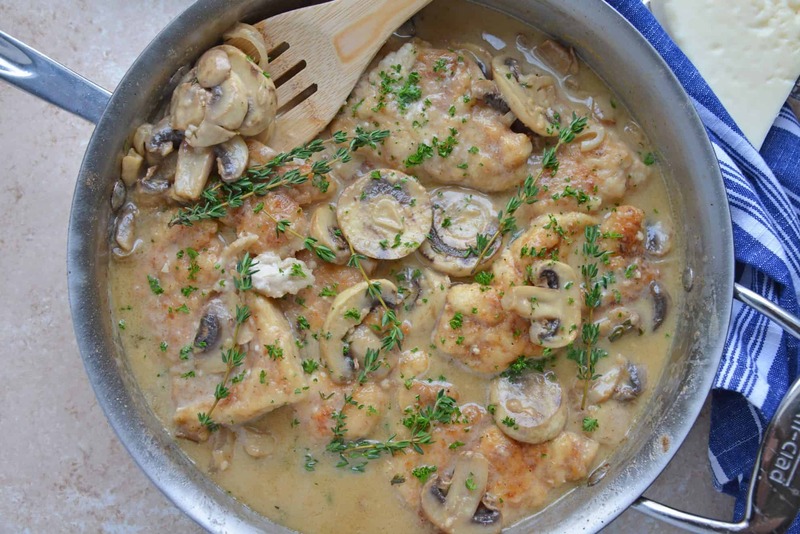 We tried Creamy Asiago Chicken a few years back and now it’s a family favorite. 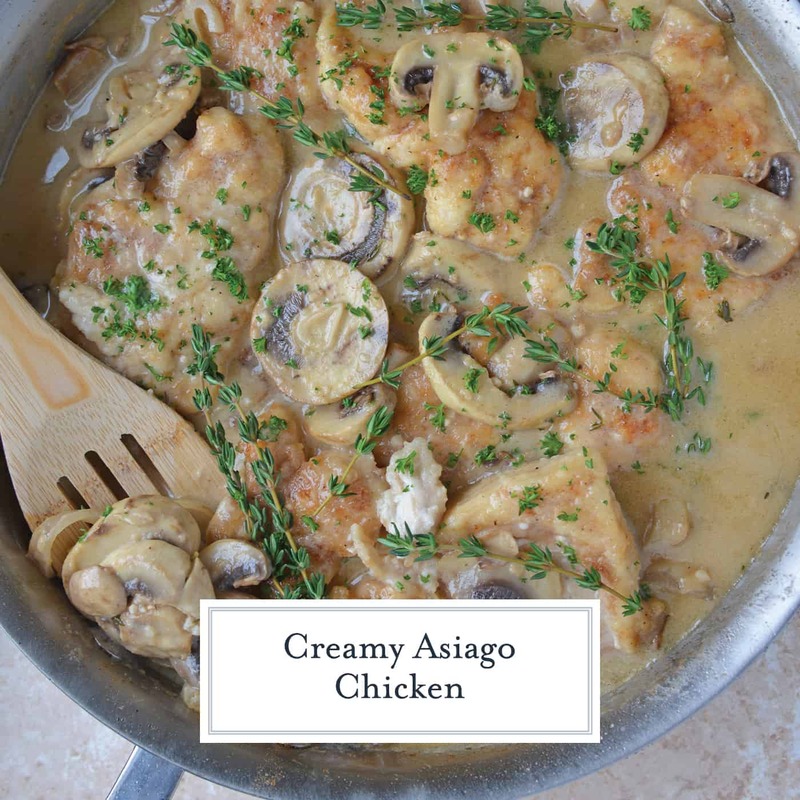 Creamy Asiago Chicken is a tasty and easy chicken recipe that is perfect for a weeknight meal. 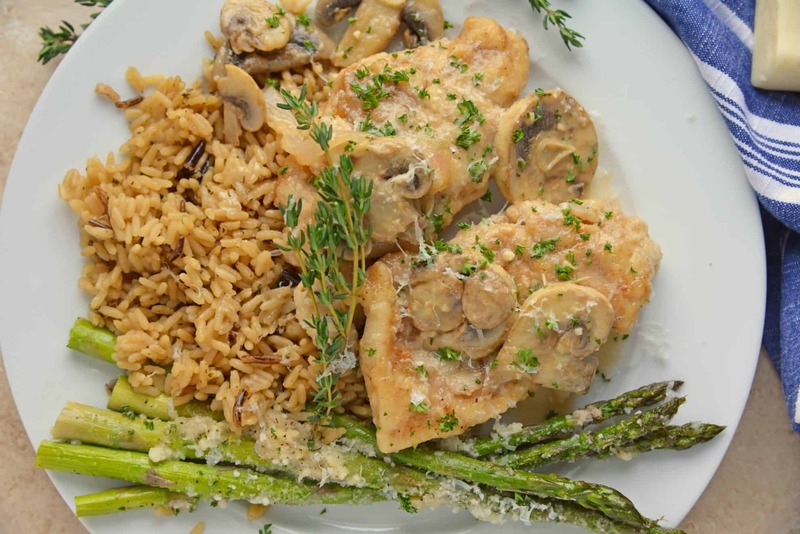 Mushrooms, shallots and thyme flavor this delicious dish. 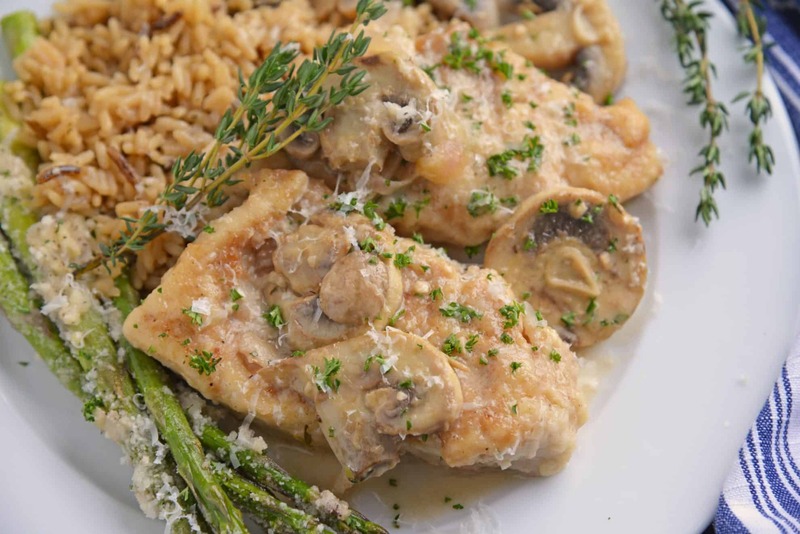 Creamy Asiago Chicken was originally published by the Midnight Baker by the name of Mushroom Asiago Chicken. 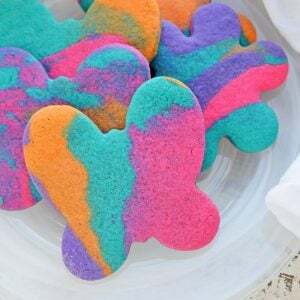 It went super viral on Pinterest and then on to win a first place award by Meredith publications and even be published in Better Homes & Gardens. 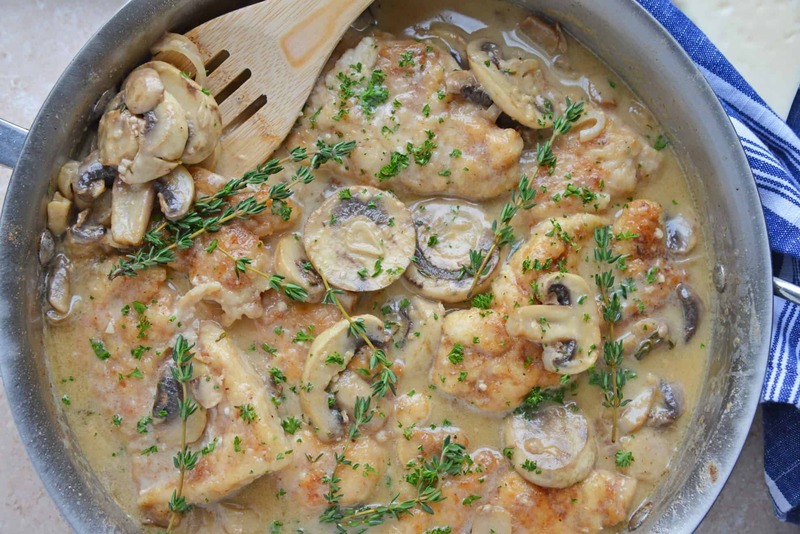 This recipe packs loads of flavor with limited effort and time, which is why it is no surprise that Asiago Chicken was such a winner to us all. It has certainly won over my home. 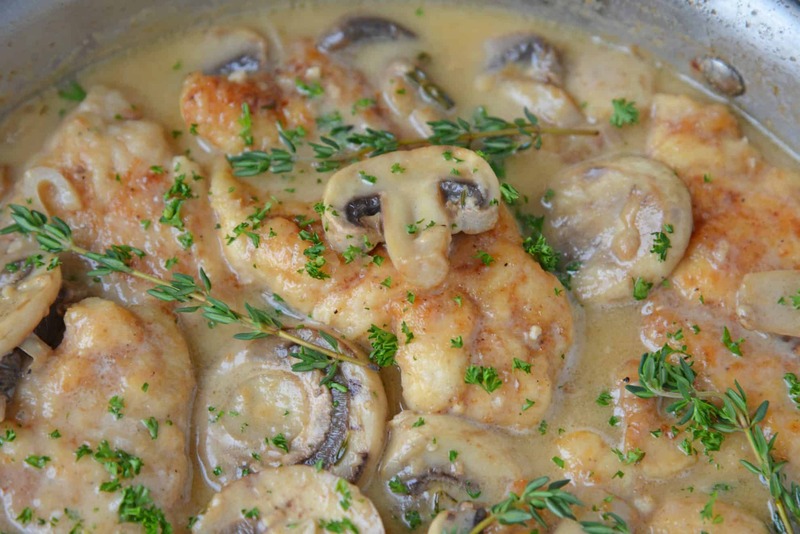 I’ve been making Creamy Asiago Chicken for several years now. It is one of my go-tos for having guests over, however my version has a few adaptations from the original. The main difference is that I added shallots. I loved the taste of garlic, but wanted some more from the onion family. Shallots can vary in strength of flavor, just like other onions, so take a quick taste before adding if you don’t want a strong onion flavor. If it is onion-y, cut the amount in half. Adding garlic powder to the flour mixture for dredging also adds a little more pizzazz. I increased the amount of butter, asiago cheese and mushrooms, feeling that it needed a little more to justify being asiago chicken. And let’s face it, I just like mushrooms and wanted more in my sauce. Instead of fresh thyme, I use dry thyme leaves. The cream sauce comes together so fast, that I wasn’t finding much thyme flavor from fresh. PRO TIP: You can still use fresh thyme. 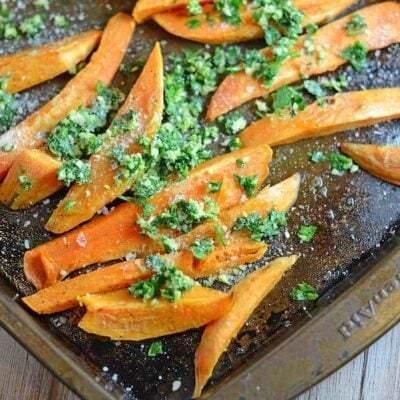 The conversion is 1 tablespoon of fresh thyme for 1 teaspoon dried thyme. 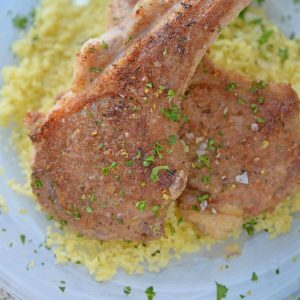 I have also made this recipe with boneless pork chops with rave reviews, so don’t limit yourself to just chicken! I can also see if being excellent with veal or even ground beef patties, like a salisbury steak, but with creamy asiago sauce. has two sides, one with little spikes and one flat? The spiky side is for tenderizing, which softens the muscle, making it easier to cut and chew. The flat side is just for pounding, which is good for making uniform thickness. Chicken will cook evenly instead of the thin end being all dry and and the thicker part being undercooked. Just by force, pounding chicken with the flat side will still tenderize your chicken, just not as much. Too much and the chicken will just fall apart. Use a good amount of Asiago cheese and freshly shred it. PRO TIP: Freshly shredded cheese tastes and melts better. Pre shredded cheese is great for many things, but it tossed in starch to prevent sticking and clumping, which can impact the creaminess of your sauce. 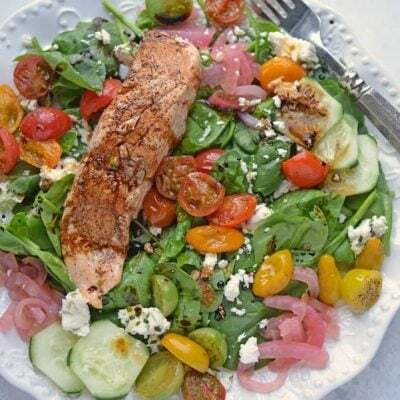 While I am usually an advocate for fresh herbs, this dish is best with dried thyme. 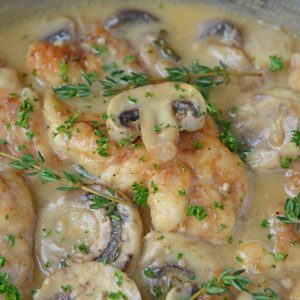 The cream sauce comes together quick and this doesn’t leave enough time for fresh thyme to infuse its flavor into the sauce. 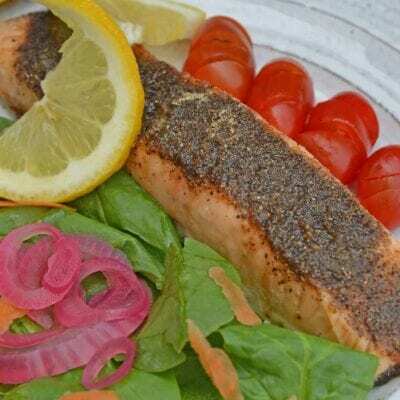 I did use fresh thyme for ganish because it is pretty and you can too! Before adding your dried thyme, rub the dried leaves together between the palms of your hands, this releases natural oils to get the most out of a dried herb. and place the date of purchase on the top of each lid so I can easily weed them out and buy new. If you using expired dried spices, you might get muted or no flavor at all. 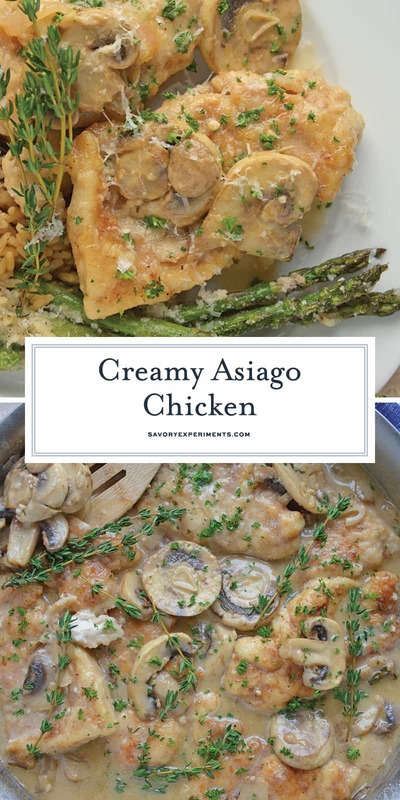 If you are serving Creamy Asiago Chicken for guests or at a dinner party, you can prepare the whole dish in an oven safe skillet and set it in the oven on 200 degrees while you enjoy your first course or salad. Simply take it out and serve when you are ready! What does asiago cheese taste like? Aged asiago cheese has a nutty flavor flavor similar to pecorino romano. It is from the northern part of Italy and is considered to be an Alpine cheese. 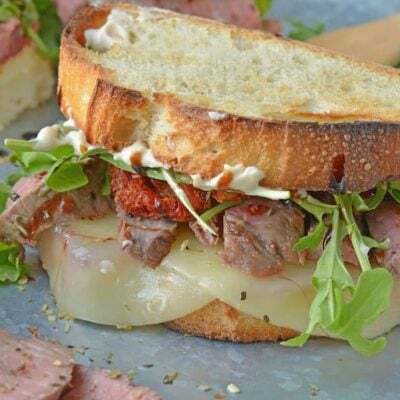 What can I substitute for asiago cheese? Many cheese will work if the pungent taste of asiago isn’t up your alley Try parmesan or pecorino romano. What can substitute for white wine? If you aren’t opposed to cooking with alcohol, a dry champagne works (speaking from experience). If you want to omit alcohol, use chicken or vegetable stock. Can I use a different cut of chicken? You sure can! 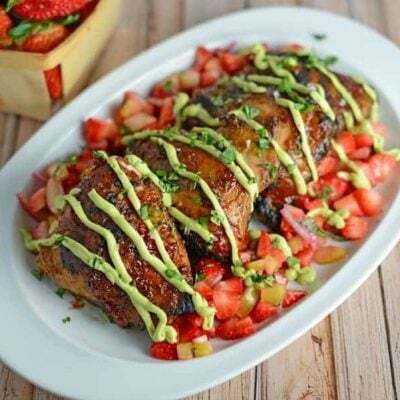 You can use chicken thighs, bone-in or fillets, drumsticks or split chicken breasts. These cuts don’t need to be tenderized and might change your cooking time. Chicken should be cooked to an internal temperture of 165 degrees. 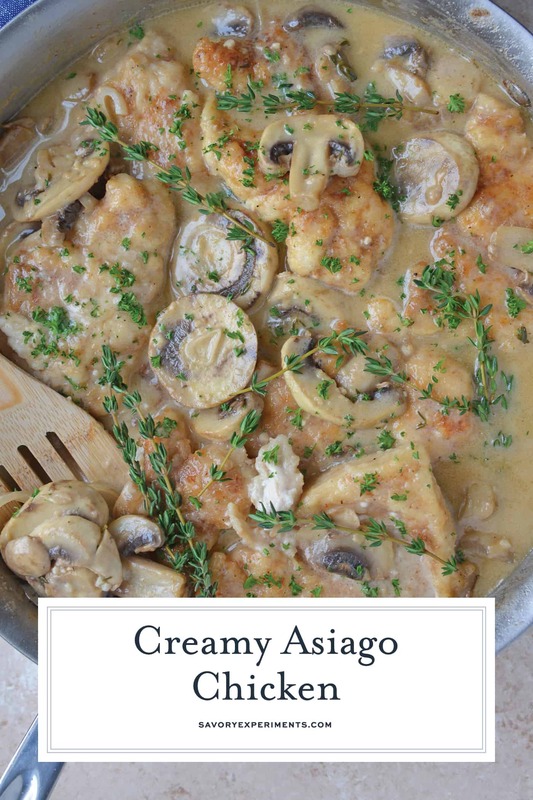 What can I serve my Asiago Chicken with? This sauce is so darn good, you’ll want a starch to serve it over so you can make sure you eat it all. Toasted Couscous, Almond Rice or plain pasta or rice are all good options. Place chicken breast between two sheets of wax paper or plastic wrap. Pound each breast with the flat side of a meat mallet until approximately 1/2 inch thick.Cut each in half to make them more manageable. Combine flour with fine sea salt, ground black pepper and garlic powder. Dredge all chicken in flour mixture and set aside. Heat butter and olive oil in large skillet over medium high heat. Working in batches, brown chicken on each side until fully cooked, approximately 3-4 minutes per minutes. Set aside, leaving all the browned bits in the pan. There should still be a little residual butter or oil in the pan. If not, add an additional tablespoon of butter. Add mushrooms, garlic and shallot, sauteing until mushrooms shrink in size and shallots soften. Add dried thyme, dry white wine and heavy cream over medium heat. When hot, add shredded asiago cheese, stirring until it thickens and fully combines. Add chicken back to the mixture, coating and reheating for 2 minutes. 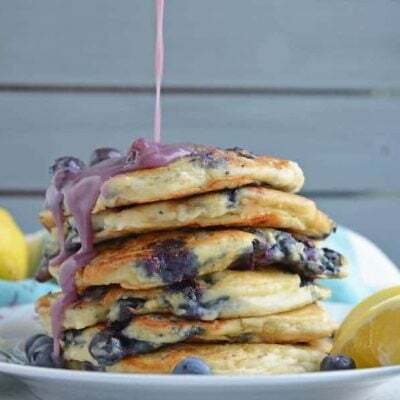 If you liked this recipe, come back and let us know how it was! This sounds sooooo good! 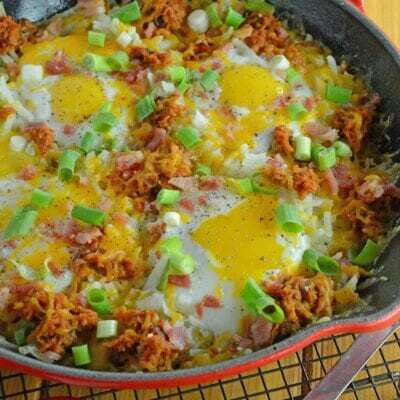 One of those amazingly comforting dishes. Asiago cheese has such a wonderful flavor. 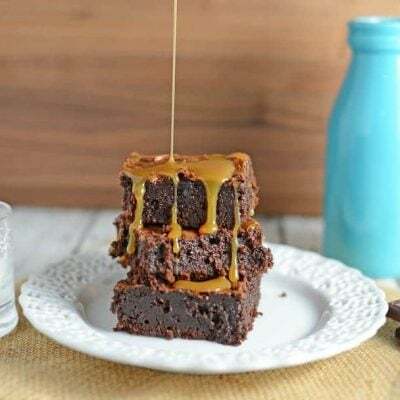 Wow – my mouth is watering just from looking at the photos. I think I’d serve this over butter noodles. Can’t wait to try! This looks like a creamy weeknight winner that even my kids would like. I agree with pounding the chicken to make it tender and do it for every chicken recipe. 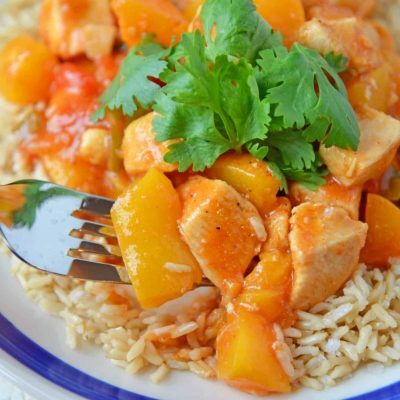 This looks creamy and comforting!